With deep regret I am putting my much loved E36 M3 Evo for sale. I’ve spent the last six months and a shed load of cash preparing this E36 for my annual Euro/Nurburgring trip in June. Unfortunately it was never ready in time and thus I’ve decided to sell as I doubt I will be able to use the car in which it was intended. Its a late 1999 Evo finished in Orinoco green, which was a individual option and quite rare. I’ve been told it was an option on the late e34 M5s. Its an amazing colour that will grow on you the more you look at it. The interior is a complimentary light green vader seat interior which suits the car and really sets it off. It has been in the hands of enthusiasts all its life and comes with a A4 folder full of almost every receipt/service invoice/MOT. Included is a spare key and the valet key. Used 18″ AC Schnitzer type II split rims with brand new Pirelli P-Zero Rosso tyres in M3 sizes. 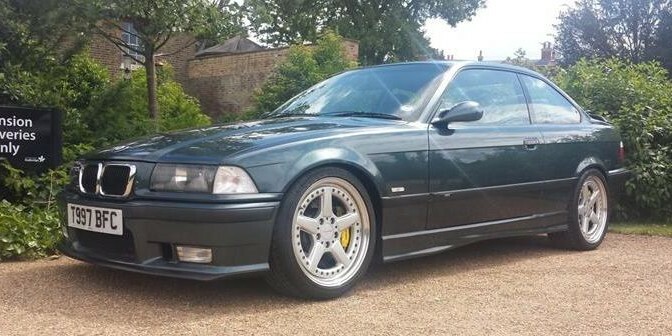 The S54 conversion was carried out in house and was based on a E46 M3 engine removed from an 2005 car that had been sourced from a well known member on M3cutters. The car was dyno’d at Evolve and made 354 BHP consistently. The only other modification I would add is there new induction kit with will add a few more horses. The factory E36 Evo 6 speed gearbox was retained, it shifts super smooth and a true joy to shift from cold to hot. We used an E46 clutch and its smooth and controllable. In fact its really soft compared to the E36. Other systems can be still read using under bonnet socket as per E36. Pretty much everything I’ve listed is brand new, even the brakes have not bedded in! The car sounds EPIC and has a totally unique sound to it – very much unlike an E36 or E46 M3. Its been described as a mini V10 noise. Its smooth and comfortable, yet offers amazing handling and so much torque from the S54 engine.